This page covers trackable assets in Motive. All of the assets and the devices (force plate and NI-DAQ) are managed under the Assets pane which can be accessed by clicking on the icon. Each type of asset is further explained in the related pages. For each Take, involved assets are displayed in the Assets pane, and the related properties show up at the Properties pane when an asset is selected within Motive. The MarkerSet is a list of marker labels that are used to annotate reconstructed markers. MarkerSets should only be used in situations where it is not possible to define a Rigid Body or Skeleton. In this case, the user will manually label markers in post-processing. When doing so, having a defined set of labels (MarkerSet) makes this process much easier. 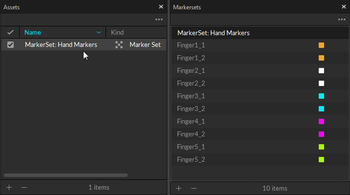 MarkerSets within a Take will be listed in the Labeling Pane, and each label can be assigned through the Labeling process. Rigid body and Skeleton assets are the Tracking Models. Rigid bodies are created for tracking rigid objects, and skeleton assets are created for tracking human motions. These assets automatically apply a set of predefined labels to reconstructed trajectories using Motive's tracking and labeling algorithms, and Motive uses the labeled markers to calculate the position and orientation of the Rigid Body or Skeleton Segment. 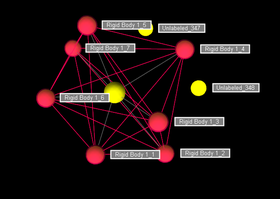 Both rigid body and skeleton tracking data can be sent to other pipelines (e.g. 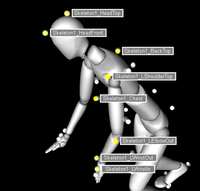 animations and biomechanics) for extended applications. If new skeletons or rigid bodies are created during post-processing, the take will need to be reconstructed and auto-labeled in order to apply the changes to the 3D data. Assets may be created during both Live (before capture) or Post (after capture, from a loaded TAK) captures. Copy and paste assets onto another Take by selecting desired assets on the Assets pane and drag-and-dropping them onto the Take on the Data Management pane. If you wish to copy assets to multiple Takes, right-click to bring up the context menu, and choose "Copy Assets to Takes". This will bring up a dialog window for selecting which assets to move. 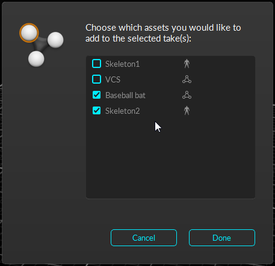 If you have a list of assets in a Take that you wish to import into the live capture, you can simply do this by right-clicking on the desired assets on the Assets pane, and selecting Copy Assets to Live. For selecting multiple items, use Shift-click or Ctrl-click. Assets can be exported into Motive-compatible rigid body (TRA) and skeleton (SKL) definition files. These files record marker arrangements calibrated in each asset, and they are used to import the asset into different takes without creating a new one in Motive. Note that these files specifically store the spatial relationship of each marker, and therefore, only the identical marker arrangements will be recognized and defined with the imported asset. Rigid body definitions are exported as TRA files from the Export Rigid Body option under the File tab. When there are multiple rigid bodies in a Take, individual definitions can be exported by selecting a rigid body and clicking the Export Rigid Body from the context menu in the Assets pane. Likewise, skeleton definitions are exported as SKL files from the Export Skeleton option under the File tab, and individual definitions are exported through the Export Skeleton option located in the context menu from the Assets pane. TIP: Rigid body and Skeleton definitions can also be quickly copied into different takes by dragging and dropping selected assets into a Take from the Data Management pane. This page was last modified on 15 August 2017, at 18:22.